Socrates (c 470 BC – 399 BC) was a renowned Greek teacher, now recognized as the father of Western philosophy. 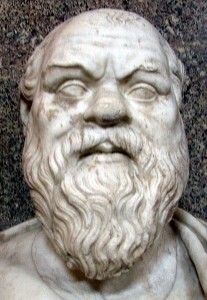 During his life, Socrates often disrupted the status quo by questioning the public and creating controversy. His views on knowledge and truth have influenced the way many people view learning. Socrates preferred conversational teaching and didn’t leave a single record behind. As a result, all of the “quotes” from Socrates we have today are actually from the writings of his students (primarily Plato and Xenophon). Eventually, Socrates was accused of failing to recognize the gods of the city and corrupting the youth through his teachings. According to Plato’s Apology, Socrates took a strong stand at the trial despite his awareness of the potential consequences. He was ultimately sentenced to death and willingly drank a cup of poisonous hemlock instead of attempting to escape with his friends. Wisdom begins in admitting your own ignorance. Self-knowledge is the ultimate virtue. People can arrive at truth through questioning. Today, many teachers will pretend to know more than they actually do. Socrates, however, would readily admit his own ignorance. In fact, he believed that recognizing this lack of knowledge set him apart from other thinkers. “I know that I am intelligent, because I know that I know nothing,” he explained. In the Apology, Socrates meets many wise politicians, poets, and artisans. Each time he realizes that he is better off because he is aware of his own ignorance. After visiting with a wise and well-regarded man, Socrates said, “Although I do not suppose that either of us knows anything really beautiful and good, I am better off than he is, – for he knows nothing and thinks that he knows; I neither know nor think that I know.” By admitting his ignorance, Socrates freed himself to question the status quo and the so-called common sense beliefs of his fellow Athenians. Socrates believed that knowledge was the ultimate virtue, best used to help people improve their lives. “The only good is knowledge and the only evil is ignorance,” he said. Socrates believed that people made immoral choices because they did not have knowledge. Unless they examined their lives and gained wisdom, people would continue to make mistakes in ignorance. “While I have life and strength I shall never cease from the practice and teaching of philosophy, exhorting any one whom I meet and saying to him after my manner: You, my friend – a citizen of the great and mighty Athens – are you not ashamed of heaping up the greatest amount of money and honor, and reputation, and caring so little about wisdom and truth and the greatest improvement of the soul, which you never regard at all? Socrates urged people to care more about developing their own understanding, knowledge he believed would lead to both goodness and happiness. Socrates’ greatest contribution to fellow learners is his theory of questioning, now called the Socratic Method. To gain true knowledge, Socrates believed that an issue must be broken into smaller questions. The answers help the thinker recognize contradictions and distill the truth. Today, the Socratic Method is used by many learners in more formal settings. Teachers of humanities and law often apply it to help students evaluate their thinking. The Scientific Method is even said to be an ancestor of Socretes’ style of questing. In the modern world, many learners rely on Socrates’ philosophies. His style of questioning, recognition of ignorance, and belief in the value of self-examination / knowledge still resonate with many independent thinkers. Steve Jobs once said that he’d trade all his technology for an afternoon with Socrates. Many learners would do the same. Apology by Plato – A monologue based on Socrates’ trial. The Ethics of Socrates – A basic outline of Socrates’ beliefs and philosophies. Socrates in Wikipedia – A general overview of Socrates’ life and history. Socrates: Philosophical Life – A detailed look at the philosopher’s experiences and positions. Socrates on Self-Confidence – A 24-minute video focusing on Socrates’ ideas about standing up for your beliefs. 9 Comments on "Great Thinkers on Self-Education: Socrates"
Thanks for taking your time to improve people’s life. Thanks for sharing. Good overview of some of Socrates’ insights. Brilliant man. Philosophy has always been a subject of interest to me for I seek ways of subjecting my self to critical reasoning or thinking.Here,I learn about the ‘self made scholar’learn free.Guide me sir. Thanks for your endeavour in enriching the knowledge of the posterity with the philosophical ideas of great Socrate. kudos!!!!! Thanks for your endeavour in enriching the knowledge of the posterity with the philosophical ideas of great philosopher of no equal. kudos!!! Socretes’ style of questing is even said to be an ancestor of the Scientific Method. ?